Taqueria Mexico on South Blvd. With cupcakes all the rage these days (and my history of cupcake criticism!) I decided to try out Juanita's Bakery on South Blvd. Offering much more than just cupcakes, Juanita's serves up traditional Dominican cakes and pastries including guava filled cakes and gorgeous birthday, shower and wedding cakes. I tried the red velvet cupcake with cream cheese icing and was very pleased. The cake was very moist and flavorful and the icing had that cream cheese flavor that makes this cupcake so good. The other great thing about Juanita's are the reasonable prices. The cupcake is $2 plus tax. With so many other shops charging $2.50 or even $3.00 for cupcakes (many of them inferior to this one) this is an excellent deal. I look forward to trying more from Juanita's soon! Samples of the gorgeous cakes available from Juanita's Bakery. 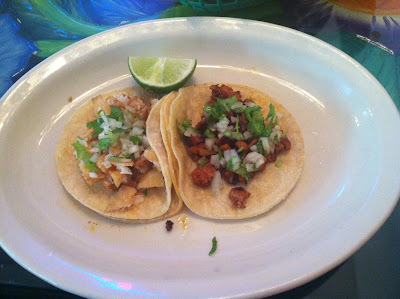 Taqueria Mexico is a refreshing little spot out South Boulevard serving up authentic, homey Mexican cuisine. 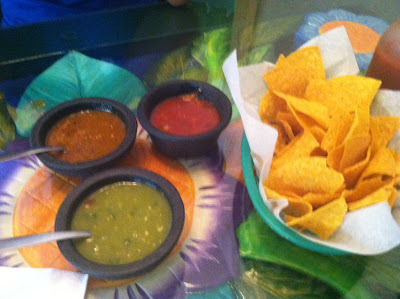 We were pleasantly surprised with the trio of salsas, including a tasty green tomatillo along with as many chips as you can handle. The tacos are a real standout here, especially the shrimp taco. The wet burrito was very good as well, with a piquant sauce and melted cheese giving it that extra touch. The menu here is huge and I look forward to returning. The prices are also very reasonable and I'm sure the larger dishes would be enough for 2 to share. I am still on the lookout for additional great Mexican spots in Charlotte, but I'm glad to have added Taqueria Mexico to my regular rotation! Guacamole salad and wet burrito. Fish taco and pork taco. Chips and salsa - nice to have so many salsa options! Pio Pio, located behind the Outback Steakhouse on East Boulevard, is known for its delicious Peruvian/Colombian rotisserie chicken. I haven't tried that yet but I did try the Jalea special, a wonderful seafood platter including both calamari and tilapia in a lime/tomato sauce with corn and onions that is simply delicious. I also sampled the mango juice, an arepa with cheese and a beef patty. The beef patty was a real standout. Two sauces, a garlic sauce and a green sauce are served with every meal - both really add a lot of flavor and probably go great with the chicken. I definitely plan on coming back to Pio Pio soon to try the chicken and other Peruvian / Colombian specialties offered. Mango juice, beef patty (back) and cheese arepa. Special - Wagyu beef ribeye with onion rings. The Capital Grille is again offering its summer wine event, The Generous Pour. This fantastic deal runs until September September 2, 2012 and is even available during Queen's Feast restaurant week, which is going on in Charlotte now until Sunday July 29. Click here to see the special menu offered by The Capital Grille for restaurant week. Here's the deal about The Generous Pour: unlimited portions of 9 different fine wines are available for a flat cost of $25. You must order an entree to participate. This is a great deal as several of these wines retail for more than $100 per bottle. It is also neat that you can have so much variety with your meal without ordering 9 separate glasses of wine. I recently had the chance to come in, have dinner and sample all of the wines available with The Generous Pour. I brought our family friend Joal Fischer along, who is not only a wine lover but also a chocolate maker and co-founder of Barking Dog Chocolatiers. We enjoyed a wonderful meal and had fun tasting the nine available wines that are unlimited when you participate in this special wine event. Joal's favorite wine of the night was the aperitif: Lunetta Rose sparkling rose from Trentino - Italy. This straightforward sparkling has very clean flavors and was a fabulous start to the meal. Other notable wines include the Falesco, Assisi Rosso 2009, the Villa Mt. Eden, Grand Reserve 2007, a Slovenian wine: Simcic, 2008/2009 - making its US debut for this event - and the South African dessert wine Kanu Kia Ora 2006, a chenin blanc - sweet and very tasty. The dessert wine was my personal favorite - it paired very well with the cheesecake, which is one of my favorite renditions of cheesecake ever. We enjoyed our food as well, particularly the entrees: salmon prepared as the seared tuna usually is and a special Wagyu steak with onion rings - very tender and succulent meat. I also enjoyed the calamari and the Wagyu carpaccio. Dessert is always a winner here as well. The ice cream sampler was very good - I love the peanut butter ice cream that was available alongside the traditional chocolate and vanilla - and the carrot cake was something I'd never had here before - also very tasty. I encourage any wine lovers out there to make your way over to The Capital Grille to dine while The Generous Pour is being offered - a great opportunity to try some excellent wines and enjoy the classic ambiance offered by The Capital Grille. Joal Fischer of Barking Dog Chocolatiers enjoying the wines from The Generous Pour. Salmon - substitution for the seared tuna - loved the ginger, white soy and wasabi sauces and the delicious coconut rice. Disclosure: The meal and wine described in this review was complimentary. Nova's Bakery, currently located on Central Avenue, is a wonderful family owned bakery and coffee shop that first opened in the late 1990's. I remember when it used to be in Southend, closer to my neck of the woods but now it is just a short trek to the current location. Nova's produces some of the best bread you can get in Charlotte including French and sourdough and turns out delicious cookies, cakes and pastries as well. My mom is a huge fan of the gingerbread men here, so we stopped in one afternoon after lunch. I also tried the red velvet cookie with white chocolate chips (very tasty). I look forward to trying more treats at Nova's again soon! Salad, green beans, tomato soup and mac & cheese served with a deviled egg and a biscuit - a great veggie plate. Dish is a funky spot in Plaza Midwood that turns out great food including wonderful vegetables. Recently my mom and I had lunch here and truly enjoyed going meatless with the wide selection on the veggie menu. I particularly enjoyed the tomato soup and the green beans and the deviled egg and biscuit really added an extra touch. Dish also has plenty of options for carnivores including burgers (veggie available), sandwiches such as fish, grilled eggplant and grilled pimento cheese, entrees like meatloaf, shrimp & grits and chicken & dumplings, a variety of salads and "South of the Border" items like nachos, burritos and quesadillas. Desserts are also offered including a wonderful sounding vanilla bourbon sweet potato pie - yum! I look forward to returning to Dish again soon. In addition to lunch and dinner service, breakfast is also served on Saturday from 10-3. Dish is closed on Sunday. Fresh fruit, squash, collards, cauliflower casserole with a deviled egg and a biscuit - yum! The Director's Cut Roll - seaweed wrap, kani and unagi (crab and eel), avocado, tofu skin, crunch, wasabi mayo and unagi sauce. How Do You Roll? just opened a new a fast-casual sushi spot in Ballantyne that allows diners to design their own sushi rolls or bowls. Protein options include many cooked meats like beef, chicken, freshwater ell (unagi) and even crawfish tails. Salmon, escolar and tuna are available raw. Both seaweed and soy wraps are available and you can choose from white or brown rice. Then you pick your veggies, toppings and sauces. Classic and original rolls designed by the restaurant are also available. This location of How Do You Roll? joins an uptown Charlotte location and two dozen or so total locations throughout the country. I was invited to preview the restaurant's offerings earlier this week and enjoyed the Director's Cut roll (above), custom shrimp roll (below) and sides such as the tasty and authentic miso soup, edamame, calamari salad and seaweed salad. I also sampled the fruit roll and green tea mochi ice cream. Whether you think you love sushi or not, this is a great alternative for a healthy, fast meal. Even if you don't like raw fish there is plenty here for you to try. Through Sunday How Do You Roll? hosts its Grand Opening, with a benefit for childhood cancer in association with the Adam Faulk Tanksley Foundation. If you donate at least $1 to the foundation now through Sunday, you get a free sushi roll or bowl - a great way to try this new spot and fight childhood cancer at the same time. Some of the available ingredients for rolling. Custom shrimp/avocado/mango roll with brown rice. The Liberty is a great place for a gourmet burger. We walked up from our house a few weeks ago after hearing about this burger's fame. The funny thing is that The Liberty did not set out to have the greatest burger but after being recognized for their burgers by The Charlotte Observer, the self-described gastropub has embraced the public's love of their burger. We tried both the traditional pub burger and the Kobe beef burger on our visit. Both were fantastic. So were the fried pickles - definitely the best fried pickles I have had. I also adored the salted caramel budino - like pudding but even better. I look forward to returning to The Liberty soon, both for more burgers and to try some of the other enticing offerings. I've heard great things about the house made soft pretzels and there is a new summer menu. Salted Caramel Budino - extremely delicious layered pudding - you must try it! Catfish and eggs with grits. My second time dining at Harvest Moon Grille was on June 24, 2012 for brunch. My mom had friends visiting from out of town and she made a reservation for 5 of us at 11 AM. The first bad sign came as the host greeted us: "The kitchen is running about 30-45 minutes behind and your table isn't ready yet." Our friends were running a bit late themselves so we thought this would be OK. They arrived about quarter after 11 and we waited quite a bit longer before being seated around 11:45. The host also promised "As soon as you sit down we'll bring you some biscuits and jam." That sounded promising. Unfortunately only after 4 requests to 4 different staff members and about an hour later did said biscuits and jam appear. They were delicious - actually the best part of the meal - hot with fresh raspberry jam. I could have eaten 3 by that point but settled for 1.5. But the late-arriving biscuits could only do so much. For a party with a reservation, the wait time we endured is totally unacceptable anywhere. I was literally about to walk out. Two couples did. One had to be at the airport and they had waited over an hour for breakfast. I was embarrassed for the city of Charlotte as many of the waiting patrons were tourists. To think this might be their lasting impression of our fair city! Very unfortunate. I advised one couple to visit Queen City Q since it was past noon. I seriously considered getting up and going elsewhere again. I felt bad for the Dunhill, an excellent hotel, that its reputation may be scarred from its proximity to the restaurant. The front of the house staff could not have been nicer although our waiter seemed overworked and was probably avoiding us because he could not bring us anything to eat. We finally got our food just after 1 PM - yes, two hours after our reservation time. The catfish and eggs with grits is a unique and very tasty dish. Everything else was nothing special, similar to the previous brunch I had here. So disappointing. The concept of farm to table cuisine is admirable but based on my experience, this place does not yield satisfactory results. Harvest Moon Grille seriously needs to take a look at its business operations and be sure they have backup. And about those biscuits: they should come out gratis to every table as soon as folks are seated, even if the kitchen is running on schedule. Another negative note: parking is supposed to be free in the Dunhill deck when you eat at Harvest Moon. When we exited, it showed a balance of $2. Although this is not a big deal in theory, considering the strife we went through just to eat, this was the last straw. We went inside and someone had the audacity to tell us that it was $2 "because we were there too long". No kidding. They finally gave us the $2 in cash to use at the machine after a lot of argument. I'm not sure if this was the hotel or the restaurant but either way, the restaurant needs to figure out how to handle this issue as well. Good thing there are more and more places to eat downtown. Some advice: find another one. Harvest Moon Eggs Benedict with pulled pork. Pulled pork sandwich with potato salad. Pork and potato salad were bland and the sauce (I had to ask for it) was sadly not much help. Sam I Am burger with sweet potato fries. Bad Daddy's Burger Bar has become a Dilworth mainstay and operates two other locations in Ballantyne and in Birkdale. Prior to becoming Bad Daddy's (formerly Big Daddy's) this location was one of the cursed spots on East Boulevard that just could not seem to make it. Now the restaurant fills up early, with lines forming and families, couples and singles alike flock for the signature burgers and salads. Our first time actually dining in (we've ordered takeout several times) we enjoyed a fine meal and decent service. The noise level is higher than I'd like, however, so maybe takeout - or the patio in cooler weather - is more my speed. The Daddy's nachos were enjoyed by all - a hefty portion with chili, black beans, guacamole, queso, sour cream and more. I enjoyed the Asian salad and a bite of the Sam I Am burger - beef burger topped with American cheese, a fried egg, rosemary ham and pesto sauce. There are several alternatives for non-burger fans, which is nice: several chopped salads including a Greek and the Asian Salad (below) ; you can also build your own salad or your own burger and chicken, tuna, black bean and turkey burger versions are available, so everyone should be happy! There are a multitude of toppings and cheeses that can be added to both burgers and salads - a fun option. The milkshake was a bit thin for my taste but I really wanted to try the Nutella version, which wasn't available the night we dined in. Although not my favorite burger joint around, Bad Daddy's is a fun option to eat with the "in" crowd - and it's family friendly to boot. Sliders with fries - a nice portion for big kids.